Manufacturer of a wide range of products which include suspended magnets. 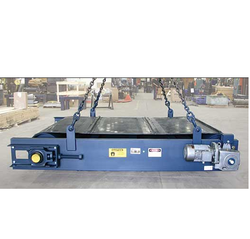 We are into the manufacturing of Suspended Magnet which comes with manual cleaning built. These are hanged on top of the belt or vibratory conveyors and magnetically lift and segregate ferrous metals out of the bulk material. Its use assist in the proper functioning of the machinery and saves maintenance cost. Looking for Suspended Magnets ?